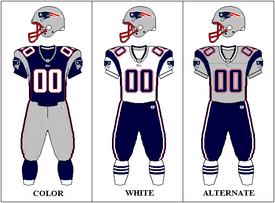 The 2006 New England Patriots season was the 37th season for the team in the National Football League and 47th season overall. They finished with a 12–4 record and a division title before losing to the Indianapolis Colts in the playoffs. The Patriots entered the season without their two starting wide receivers from 2005; David Givens left in free agency while Deion Branch held out for a new contract before being traded in early September. Eventually replacing them were Reche Caldwell and Jabar Gaffney, who was signed as a street free agent in October. Back-to-back losses in November ended the team's streak of 57 games without consecutive losses, three games shy of the NFL record. Trying to rebound from their home loss to the Colts, the Patriots stayed at home for a rainy AFC East rematch with the Jets. After a scoreless first quarter, the Patriots struck first with a Gostkowski 31-yard field goal. However, the Jets would fire back with running back Kevan Barlow getting a touchdown on a two-yard run. Gostkowski would get one more field goal for New England, in the form of a 21-yarder. In the third quarter, New York kicker Mike Nugent kicked a 34-yard field goal for the only score of the period. In the fourth quarter, the Jets continued their pursuit, as Pennington completed a 22-yard touchdown pass to Cotchery. The Patriots tried to fight back, as Brady completed a 15-yard touchdown pass to Caldwell, following it up with a successful two-point conversion pass to Caldwell. However, New York's defense managed to bottle up any chance of a New England comeback. With the loss, the Patriots would lead the Jets by one game in the AFC East at 6–3. Also with the loss, the Patriots' 57-game streak without consecutive losses, which dated back to the 2002 season, was snapped. The San Francisco 49ers still hold the record of 60-straight games without consecutive losses (1995 – 1999). For Tom Brady, this would be his last regular-season loss at home until Week 9 of the 2011 season. As of the end of the 2012 season, this would be the last time Brady would lose at home to another AFC team during the regular season. 1 2 Crouse, Karen (November 12, 2006). "NFL: Jets end streak of losses to Patriots". The New York Times. International Herald Tribune. Retrieved June 19, 2007. ↑ Reiss, Mike (January 17, 2006). "Mangini links". Boston.com Reiss' Pieces. Retrieved June 19, 2007. ↑ Reiss, Mike (January 17, 2006). "Pees the choice". Boston.com Reiss' Pieces. Retrieved June 19, 2007. ↑ Reiss, Mike (April 30, 2006). "Belichick bits". Boston.com Reiss' Pieces. Retrieved June 19, 2007. ↑ Reiss, Mike (January 20, 2006). "McDaniels promoted". Boston.com Reiss' Pieces. Retrieved June 19, 2007. 1 2 Reiss, Mike (March 21, 2006). "Eyes on Adam". Boston.com Reiss' Pieces. Retrieved June 19, 2007. ↑ Reiss, Mike (March 14, 2008). "Givens update". Boston.com Reiss' Pieces. Retrieved June 19, 2007. ↑ Reiss, Mike (March 9, 2006). 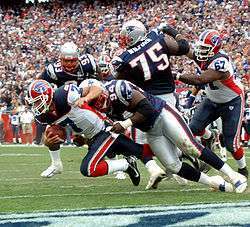 "McGinest out". Boston.com Reiss' Pieces. Retrieved June 19, 2007. ↑ Reiss, Mike (March 15, 2006). "McGinest to Browns". Boston.com Reiss' Pieces. Retrieved June 19, 2007. ↑ Reiss, Mike (March 16, 2006). "Poole released". Boston.com Reiss' Pieces. Retrieved June 19, 2007. ↑ Reiss, Mike (February 25, 2006). "Pats cut Starks". Boston.com Reiss' Pieces. Retrieved June 19, 2007. ↑ Reiss, Mike (March 13, 2006). "Chad Brown released". Boston.com Reiss' Pieces. Retrieved June 19, 2007. ↑ Reiss, Mike (July 27, 2006). "Brown to town". Boston.com Reiss' Pieces. Retrieved June 19, 2007. ↑ Reiss, Mike (September 1, 2006). "Personnel moves". Boston.com Reiss' Pieces. Retrieved June 19, 2007. ↑ Reiss, Mike (March 12, 2006). "Andre' Davis to Bills". Boston.com Reiss' Pieces. Retrieved June 19, 2007. ↑ Reiss, Mike (March 12, 2006). "Fauria to 'Skins". Boston.com Reiss' Pieces. Retrieved June 19, 2007. ↑ Reiss, Mike (March 13, 2006). "Chatham to Jets". Boston.com Reiss' Pieces. Retrieved June 19, 2007. ↑ Reiss, Mike (March 23, 2006). "Ashworth to 'Hawks". Boston.com Reiss' Pieces. Retrieved June 19, 2007. ↑ Reiss, Mike (April 9, 2006). "Marshall in town". Boston.com Reiss' Pieces. Retrieved June 19, 2007. ↑ Reiss, Mike (September 11, 2006). "Branch traded". Boston.com Reiss' Pieces. Retrieved June 19, 2007. ↑ Reiss, Mike (August 8, 2006). "Tucker traded". Boston.com Reiss' Pieces. Retrieved December 1, 2007. ↑ Reiss, Mike (August 22, 2006). "Gorin follow". Boston.com Reiss' Pieces. Retrieved December 1, 2007. ↑ Reiss, Mike (September 1, 2006). "Personnel moves". Boston.com Reiss' Pieces. Retrieved December 1, 2007. ↑ Reiss, Mike (September 2, 2006). "Pick update". Boston.com Reiss' Pieces. Archived from the original on May 23, 2011. Retrieved December 1, 2007. ↑ Reiss, Mike (March 17, 2006). "More on Caldwell". Boston.com Reiss' Pieces. Retrieved June 19, 2007. ↑ Reiss, Mike (August 18, 2006). "Seau signed". Boston.com Reiss' Pieces. Retrieved June 19, 2007. ↑ Reiss, Mike (April 1, 2006). "Mitchell agrees". Boston.com Reiss' Pieces. Retrieved June 19, 2007. ↑ Reiss, Mike (April 6, 2006). "Pats sign pair". Boston.com Reiss' Pieces. Retrieved June 19, 2007. ↑ Reiss, Mike (May 8, 2006). "Pats sign 2". Boston.com Reiss' Pieces. Archived from the original on May 7, 2007. Retrieved June 19, 2007. ↑ Reiss, Mike (February 7, 2006). "Pats re-sign Davis". Boston.com Reiss' Pieces. Retrieved June 19, 2007. ↑ Reiss, Mike (March 2, 2006). "Poteat re-signs". Boston.com Reiss' Pieces. Retrieved June 19, 2007. ↑ Reiss, Mike (March 5, 2006). "Tucker agrees". Boston.com Reiss' Pieces. Retrieved June 19, 2007. ↑ Reiss, Mike (March 8, 2006). "Artrell agrees". Boston.com Reiss' Pieces. Retrieved June 19, 2007. ↑ Reiss, Mike (March 22, 2006). "Scott re-signs". Boston.com Reiss' Pieces. Retrieved June 19, 2007. ↑ Reiss, Mike (March 24, 2006). "Neal, Brown in fold". Boston.com Reiss' Pieces. Retrieved June 19, 2007. ↑ Reiss, Mike (March 29, 2006). "Evans' terms". Boston.com Reiss' Pieces. Retrieved June 19, 2007. ↑ Reiss, Mike (April 12, 2006). "More on Seymour". Boston.com Reiss' Pieces. Retrieved June 19, 2007. ↑ Reiss, Mike (October 12, 2006). "Koppen extended". Boston.com Reiss' Pieces. Retrieved June 19, 2007. ↑ Reiss, Mike (June 6, 2006). "Hochstein extended". Boston.com Reiss' Pieces. Retrieved June 19, 2007. ↑ Reiss, Mike (June 5, 2006). "Bethel traded". Boston.com Reiss' Pieces. Retrieved June 19, 2007. ↑ Solomon, Jerome (June 30, 2006). "Patriots' Sullivan arrested". The Boston Globe. Retrieved May 31, 2008. ↑ Reiss, Mike (October 9, 2006). "Gaffney signed". Boston.com Reiss' Pieces. Retrieved June 19, 2007. ↑ Reiss, Mike (October 10, 2006). "Vikes sign Bethel". Boston.com Reiss' Pieces. Retrieved June 19, 2007. ↑ Reiss, Mike (September 2, 2006). "Gabriel to Pats". Boston.com Reiss' Pieces. Archived from the original on May 23, 2011. Retrieved December 1, 2007. ↑ The Patriots traded second- and third-round draft picks (52 and 75 overall) to the Green Bay Packers for the Packers' second-round pick (36 overall). The Patriots acquired the No. 75 pick in a trade with the Baltimore Ravens in which the Patriots traded their second-round pick in the 2005 NFL Draft for the Ravens' third- and sixth-round picks in 2005 and their third-round pick in 2006. Patriots.com summary Archived May 19, 2011, at the Wayback Machine. ↑ Draft pick received from the Detroit Lions during the 2005 NFL Draft for the Patriots' 2005 fifth-round pick (received with Duane Starks for the Patriots' 2005 third-round pick and 2005 fifth-round pick in 2005) and 2005 sixth-round pick. Archived May 19, 2011, at the Wayback Machine. ↑ "Bill Belichick stats". All Things Bill Belichick. Retrieved June 19, 2007. ↑ Reiss, Mike (September 17, 2006). "Pats notes". Boston.com Reiss' Pieces. Retrieved June 19, 2007. ↑ Reiss, Mike (November 10, 2006). "Troy's game ball". Boston.com Reiss' Pieces. Retrieved June 19, 2007. ↑ Reiss, Mike (November 14, 2006). "More on field". Boston.com Reiss' Pieces. Archived from the original on May 15, 2007. Retrieved June 20, 2007. ↑ "Patriots vs. Bears: Game notes". Patriots.com. November 26, 2006. Retrieved June 19, 2007. ↑ 2006 NFL Record and Fact Book. p. 347. ISBN 1-933405-32-5. ↑ Reiss, Mike (November 2, 2006). "Honor for Brady". Boston.com Reiss' Pieces. Retrieved December 21, 2007. ↑ Reiss, Mike (August 29, 2006). "Green wins award". Boston.com Reiss' Pieces. Retrieved December 21, 2007. ↑ Reiss, Mike (October 4, 2006). "Practice notes". Boston.com Reiss' Pieces. Retrieved December 21, 2007. ↑ Reiss, Mike (January 10, 2007). "Award for Harrison". Boston.com Reiss' Pieces. Retrieved December 21, 2007. 1 2 Reiss, Mike (October 5, 2006). "Honor for Maroney". Boston.com Reiss' Pieces. Retrieved December 21, 2007. ↑ Reiss, Mike (October 24, 2006). "Honor for Maroney". Boston.com Reiss' Pieces. Retrieved December 21, 2007. ↑ Reiss, Mike (December 19, 2007). "Welker: 12th player award". Boston.com Reiss' Pieces. Retrieved December 19, 2007. ↑ Reiss, Mike (November 29, 2006). "Award for Samuel". Boston.com Reiss' Pieces. Retrieved December 21, 2007. ↑ Reiss, Mike (January 4, 2007). "Pats chatter". Boston.com Reiss' Pieces. Retrieved December 21, 2007. ↑ "Jaguars' Henderson, Vikings' Williams added to Pro Bowl". Associated Press. ESPN.com. January 26, 2007. Retrieved June 16, 2008. ↑ Reiss, Mike (February 6, 2007). "Light to Pro Bowl". Boston.com Reiss' Pieces. Retrieved June 19, 2007. ↑ Beacham, Greg (February 9, 2007). "Vince Young Not on Vacation at Pro Bowl". The Washington Post. Retrieved June 19, 2007.